Madrid, Spain, Feb. 12, 2010 – HP today announced an innovative new device that gives people a new way of connecting to the essentials of online life – the Internet, email, messaging, social networking, photos, music and more(1). Unveiled just days before the start of Mobile Wold Congress, the Compaq AirLife 100 combines a 10.1-inch diagonal screen, a 92 percent full size keyboard,16 GB solid state internal storage, SD™ Card slot, full multitasking Android operating system and customized touch interface. Leveraging its legacy and innovation in touch, the HP customized interface features a new “tabbed” touch browser experience, a simple mechanism for zooming web pages, and a touch optimized media suite and shortcut menu. This launch also builds on the strategic announcement signed in November 2009 by HP and Telefónica, one of the world´s leading telecommunication companies, to supply joint mobile broadband services to markets across Europe and Latin America. HP and Telefónica are working together to offer customers a compelling online experience right out of the box. The custom touch interface allows for easy navigation of music, entertainment, information and access to the Telefónica store and services. “The browser has become the desktop for many people, and the new Compaq AirLife is the next evolution of a mobile computer that is streamlined specifically for the web,” said Charl Snyman, Vice President and General Manager, HP Personal Systems Group, Europe, Middle East and Africa (EMEA). 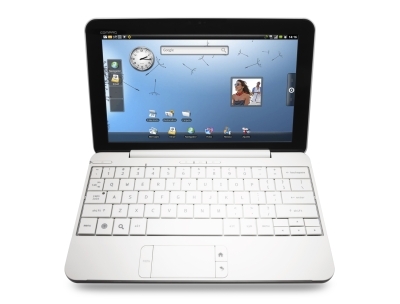 With “instant on” for immediate enjoyment, integrated 3G cellular, (2) Wi-Fi connectivity(1) VGA webcam, all- day computing (up to 12 hours of battery life in active use and up to 10 days of standby time), (3) the AirLife morphs the best of a smartphone into a netbook to keep up with the most demanding online lives. The AirLife also features global positioning system (GPS) capabilities. NDrive navigation software comes preinstalled. The AirLife 100 features Qualcomm’s Snapdragon™ QSD8250 chipset platform to offer a combination of mobile processing performance, optimized power consumption, ubiquitous connectivity and powerful multimedia in a single chip. Available in Cloud White, and sold exclusively thorough Telefónica, the Compaq AirLife 100 is expected to be available in Spring 2010 in select countries. HP also announced the HP iPAQ Glisten, a feature-rich 3G world phone, that will also be available through Telefónica’s in Latin America. The HP iPAQ Glisten is HP’s first smartphone with an AMOLED (active-matrix organic light-emitting diode) screen. Featuring the Microsoft Windows® Mobile 6.5 operating system, the iPAQ Glisten offers a touch-friendly user interface and improved browser with Flash support. Connections to users’ favorite people, content and applications are a fingertip away on the redesigned Start Menu, and Internet Explorer Mobile(5) supports the rich experiences that many web pages offer for desktop computers. Users can easily move between work and leisure with advanced mobile email capabilities, built-in Wi-Fi(5) and GPS(4) functionality, and rich multimedia features and applications. The iPAQ Glisten features a full QWERTY keyboard and five-way directional pad for fast, easy and accurate messaging including SMS/MMS and email. The touch-enabled AMOLED screen allows users to easily navigate through menus, windows and links with the touch of a finger.